Cape Malay Chicken Curry: How Tasty. 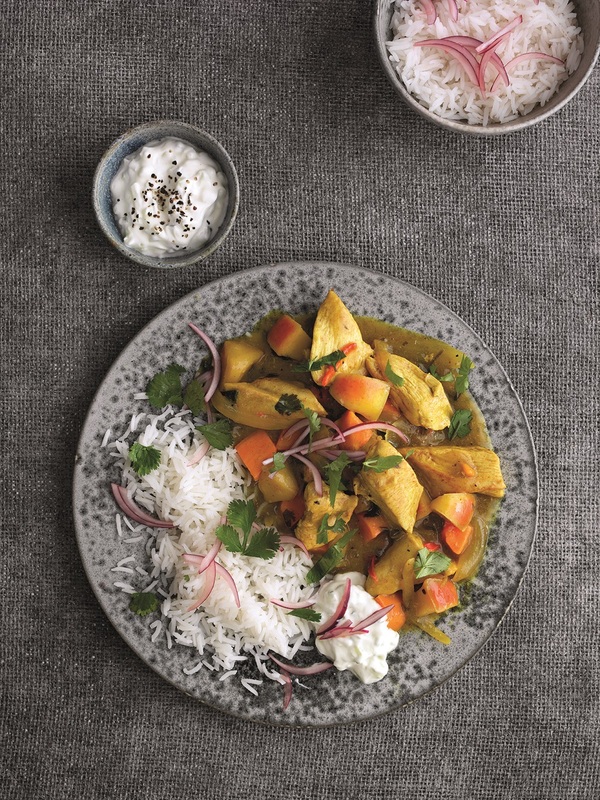 This Indian-influenced curry is a fragrant combination of chicken, onions, garlic, South African apple and sweet potato with turmeric, chillies, cumin and cardamom. It’s a spicy, warming treat! Melt the butter in a large saucepan and gently fry the onion and garlic for 4-5 minutes, until softened. Add the chilli, turmeric, cumin, cardamom pods and cinnamon stick and fry gently for another 1-2 minutes. Stir in the chicken and cook for 2-3 minutes to seal, then add the apple, sweet potato, coconut milk, stock and coriander. Simmer gently, partially covered, for 30-35 minutes, topping up with a splash of hot water if needed. About 10 minutes before the end of cooking time, put the rice on to cook in lightly salted simmering water. Cook for 10 minutes, or until tender. Mix the cucumber and yogurt together and season with a pinch of salt. Thicken the curry with the blended cornflour, then serve with the rice and cucumber raita, garnished with red onion and chopped coriander. Cook’s tip: Use regular potato instead of sweet potato, if you prefer. The campaign is run by HORTGRO, the industry association representing South African fruit growers. Recipe and images courtesy of: South African Fruit. What do you think of this Cape Malay Chicken Curry recipe? Thai Chicken And British Asparagus Curry With Turmeric Rice. Thai Prawn And Pineapple Curry: Pineapple: The Comeback Kid! "Butterfly Forest: The Wordless Or Not So Wordless Wednesday Link Up"
"How To Make Chocolate Beetroot Cupcakes"